Everyone wants a closer look at the Ford GT . . . especially the Colorado State Patrol. With deliveries beginning soon, Ford is putting the final touches on its highly-anticipated GT supercar. Among other things, that means the GT is being subjected to high-altitude testing in the mountains of Colorado. Lots of car spotters have caught the GTs on the move, but so has a very different group:The Colorado State Patrol. 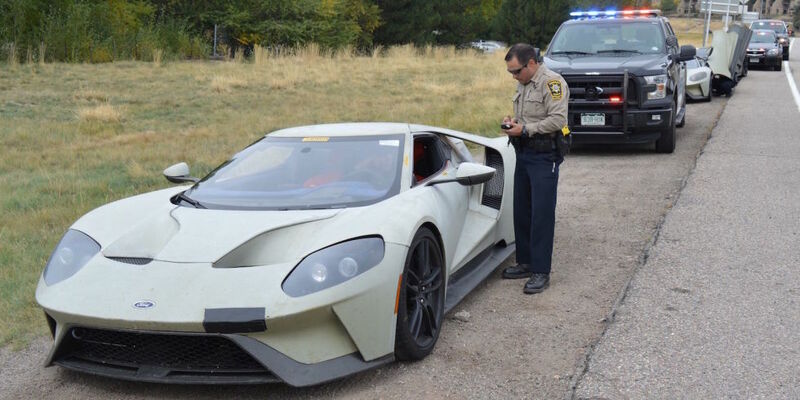 Vail Daily reports that three Ford GT prototypes were pulled over for speeding in Avon, Colorado on Tuesday. A spokesperson for the Avon Police Department told Road & Track the three GTs were doing around 100 mph in a 50 mph zone. The three GTs spotted are clearly in the rough prototype stage, and Vail Daily reports that each of the three cars carried extensive data logging equipment. The prototypes were first spotted by the Colorado State Police, and pulled over by a local sheriff's office. The Avon Police told Road & Track that it's unusual to see automakers testing prototypes in this area, especially prototypes for limited-run supercars. One has to imagine the officers got a kick out of this one. We suspect this won't be the last time a Ford GT gets pulled over, though. Nancy Pelosi blows off traffic laws — to shop at shoe store!